VIDEO - European Jewish Congress President Dr. Moshe Kantor has called for an apology from the Sunday Times, which published a cartoon on International Holocaust Remembrance Day of Prime Minister Benjamin Netanyahu building a wall on the bodies of Palestinians, depicting their blood as cement. The cartoon, drawn by Gerald Scarfe, includes a caption stating: "Israeli elections - will cementing peace continue?" “This cartoon would be offensive at any time of the year, but to publish it on International Holocaust Remembrance Day is sickening and expresses a deeply troubling mindset,” Dr. Kantor said. “This insensitivity demands an immediate apology from both the cartoonist and the paper’s editors. “Amazingly, as this cartoon was published days after the only democracy in the Middle East, Israel, underwent fully democratic elections, as others in the Middle East were being butchered by the tens of thousands, the Sunday Times focuses its imagination solely on the Jewish state. "This contravenes many of the criteria laid out in EUMC’s Working Definition of Anti-Semitism and is part of a worrying trend to legitimize the growing assault on Israel by opinion-shapers," Kantor concluded. 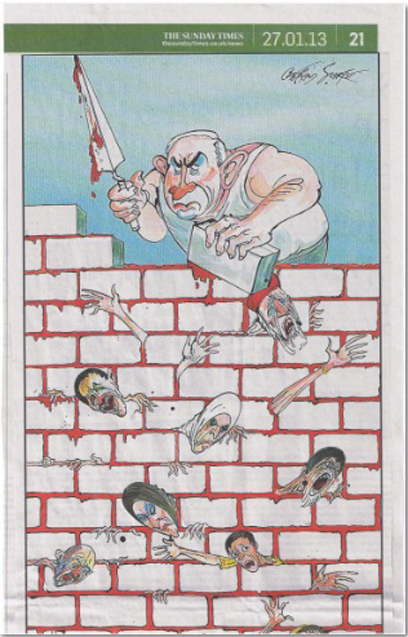 Commenting on the cartoon at the request of Germany newspaper the Algemeiner, the Sunday Times said: “This is a typically robust cartoon by Gerald Scarfe. The Sunday Times firmly believes that it is not anti-Semitic It is aimed squarely at Mr. Netanyahu and his policies, not at Israel, let alone at Jewish people." See all talkbacks "EJC: Sunday Times cartoon 'sickening' "